These ice cube chippers were designed to chip ice cubes in the drinking glass. The group is divided in the sections shown below. The top of the box is marked with Mr. Chips Another member of the Mr. Bartender PRODUCTS, TORRANCE, CALIFORNIA. The chipper head is rectangular in shape and holds four picks. There are no markings on the chipper head, ferrule or handle. The box top is marker "quick - chip" deluxe "THE ICE CHIPPER". The sides of the box displays the instruction to use the chipper, which happens to be the same as the "CHIP-CHOP" The chipper has a chrome finished stainless steel handle. A bottle opener in designed into the handle. 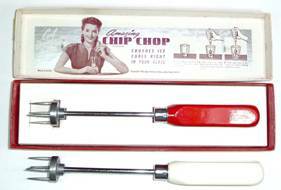 This chipper is "AN ANCHOR PRODUCT"
The box top is marked "EASY ICE CRAX" The inside top refers to the chipper as "Magical" and "Bar model" Along with a photo of the chipper being used to break ice cubes (more that one cube at a time) in a glass it states "SHEDS ICE RIGHT IN GLASS BY SMOOTH ACTION" This is " A HALSEY METALCRAFT Product" LIPPER & MANN, N.Y.C. The chipper has a round head with five picks. There are no marking on the chipper. It is all metal and the handle has six groves around it. The three basic shapes of pick supports. The one on the left is round and supports five picks. This is the only configuration that has the CHIP CHOP PAT PEND markings; however, all round supports do not have the markings. The other two configurations don't show any markings. The center one is rectangular and holds four picks and the one on the right is six sided and holds five picks. L = 9-1/8" extended, 7-7/8" compressed. CHIP CHOP PAT PEND on top of the round pick support. Instructions how to use the Chip Chop is on one side of the handle and recipes for mixed drinks are on the other three sides. Shows how CHIP CHOP PAT PEND is marked on the pick support. L = 9-1/8" extended, 7-7/8"compressed (both). APEX PRODUCTS CORP. NYC marked on the end of ferrule and CHIP CHOP PAT PEND on the pick support. L = 9-7/8" extended, 8-3/8" compressed. CHIP CHOP PAT PEND on the round support with five picks. Cap lifter and cork screw combination at the end of the handle. The cap lifter has a single, large tab at the base of the loop. All metal and there are two groves near each end of the handle. L = 9-7/8" extended, 8-3/4" compressed. CHIP CHOP PAT PEND on the round support with five picks. Cap lifter and cork screw combination at the end of the handle. The cap lifter has a single, large tab at the base of the loop. The center section of the handle is loose and can be rotated to expose recipes for mixing alcohol drinks. L = 9-3/4" extended, 8-3/8' compressed. CHIP CHOP PAT PEND on the round support with five picks. There no other markings. Cap lifter and cork screw combination at the end of the handle. This chipper is the same as the one above except for the cap lifter/cork screw. The cap lifter on this one is more squared-off and has two typical tabs. L = 9-3/4' extended, 8-1/2" compressed. CHIP CHOP PAT PEND on the round support with five picks. Cap lifter and cork screw combination at the end of the handle. The cap lifter has a single, large tab at the base of the loop. The center portion of the handle is covered with leather and has the following markings - "NORFORK, BALIMORE & CAROLINA LINE and N. B. & C. MOTOR LINES. L - 9-5/8"' extended, 8-3/8" compressed. CHIP CHOP PAT PEND on the round support with five picks. Cap lifter and cork screw combination at the end of the handle. The cap lifter has a single, large tab at the base of the loop. The center portion of the handle is covered with leather with no markings. L = 9-1/8" extended, 7-7/8"compressed. There are no marking the chipper. The handle is wooden and flattened on two opposite sides. L = 9-1/8" extended, 7-3/4" compressed (top) and L = 9" extended, 7-3/4 compressed (bottom). The top one has the rectangular support with four picks and the bottom has a six-sided support with five picks. Both handles are tapered cylinders and wooden. There are no markings on either chipper. 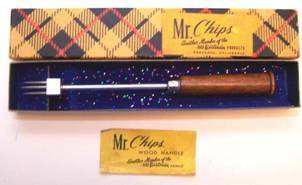 The top chipper is found in the Mr. Chips sales box. L = 9-1/4" extended, 8" compressed. Round support with five picks. There is a cap lifter built into the handles and five groves around the handle. There are no other markings on the chipper. L = 9-3/8" extended, 8-1/4" compressed. Six-sided support with five picks. A cap lifter designed into the handle. There are no markings on the chipper. L = 9" extended, 8" compressed. Round support with five picks. The handle has six groves around it, but there are no other markings. This chipper can be found in the "EASY ICE CRAX" sales box. L = 9-1/8" extended, 8" compressed. Rectangular support with four picks. A cap lifter designed into the handle. There are no markings on the chipper. This chipper is found in the "quick - chip" sales box. L = 9-5/8" extended, 8-1/2" compressed. Rectangular support with four picks. A cap lifter designed into the handle. The center section of the handle is loose and can be rotated to expose recipes for mixing alcohol drinks. There are no other markings. Comparison of the CHIP-CHOP and other ice cube chipper with the drink mix recipes in the handle. The spring for these chippers is in the shaft instead of the handle. The spring pushes the cup back over the picks when the chipper is removed from the ice strike. The photo to the left shows the markings - HOSTESS, MFG BY DUNKS DAYTON, O. PAT APP'D FOR around the top side of the cup covering the picks. L = 8-1/8" extended, 8" compressed. HOSTESS, MFG BY DUNKS, DAYTON, O., PAT APP'D FOR, This configuration does not allow the cup to be latched in the open position. The handle is wooden and has six flattened sides. Protection cup can be locked open for these two. Chip-Chop style ice cube chipper with a cup over the tines. Tapering diamond shaped Bakelite handle with THE HILL & GRIFFITH CO. Engraved on one flat of the four sided handle. HOSTESS, PAT APPL FOR, MFG BY DUNK'S DAYTON, O. Another handle color. Same shape as above. HOSTESS, MFG BY DUNKS DAYTON, O., PAT APP'D FOR around the top side of the cup covering the picks. The shafts between the cup and handle are brass as is the identification ring on top of the cup. The tab that holds the cup in the open position has broken off on this sample. The cup is aluminum. HOSTESS, MFG BY DUNKS, DAYTON, O., PAT APP'D FOR, Cup pushes back when chipping ice then spring back after finished. Six sided tapered orange handle. No pin to hold the cup in the retracted position. It appears the handle was originally painted yellow and later over painted with the orange. Dunks, DAYTON, OH., PAT PEND around the top of the protective cup, Cup pushes back when chipping ice then springs back after finished. Six sided wood handle with metal cap attached with a screw. Protective cup can be locked open. L = 10-1/4" extended, 9-1/4" compressed. The cup is in a fixed position to the picks. Approximately 3/8' of the picks are always exposed. This configuration has five picks. The spring is in the tube attached to the handle. There are no markings on the chipper. Ice Cube Chipper with a fixed protective cup over the five tines. No ferrule and no spring in the handle. Unable to disassemble the handle or the cap on the spring housing to determine if there was a spring at one time. Maybe this ice chipper type was sold in both configurations.